Today the Senate released its proposed operating budget, which would support state government services and programs for the next two years. This includes funding education and making critical investments in the social services “safety net” that protects our state’s most vulnerable residents. While our proposal would increase state spending (putting much of the increase toward schools as mandated by the state Supreme Court), it stays within the amount of available state revenue and proposes no new taxes, which is important for families and employers across our state. The Senate also released our proposed transportation budget for 2017-19. Between the three major transportation packages adopted in the past dozen years (the most recent being 2015’s “Connecting Washington” package), most of the revenue from the state gas tax is committed to specific highway projects – but not all of it. As a member of the Senate Transportation Committee, I am constantly seeking opportunities to bring more infrastructure dollars to our part of the state. This year, I am seeking additional state funding to help complete the much-needed Hwy 2/West Cashmere Bridge Project. I have arranged for a group of local officials to make a presentation to the chairs of the House and Senate Transportation Committees tomorrow in an effort to secure funding for this project. I’ll keep you posted on this effort. I expect the Senate capital-budget proposal to be released soon. This budget funds public buildings and other facility-related investments. Once all three of the required budget proposals are on the table, I am hopeful that we will see the House’s corresponding proposals quickly. That will allow negotiations to get under way and the Legislature to work toward final agreements. One of the meetings I arranged for tree-fruit growers Monday was with Speaker of the House Frank Chopp, pictured at near right. As I discussed in a recent email update, I introduced Senate Bill 5720 at the request of the Washington State Tree Fruit Association. By passing the bill, the Senate showed its support for both employers and workers in one of our state’s most important industries. The bill addresses the decision in Demetrio v. Sakuma Brothers Farms, Inc. in which the state Supreme Court ruled employers must pay employees for rest breaks separate and apart from piece-rate wage payments. The many lawsuits stemming from the 2015 ruling are jeopardizing orchards and people’s livelihoods. SB 5720 details a process for how workers can be paid for past uncompensated rest breaks and growers can be protected from lawsuits. Although the bill has bipartisan sponsorship and received a bipartisan 28-18 vote in the Senate, it hasn’t been scheduled for a committee hearing in the House. 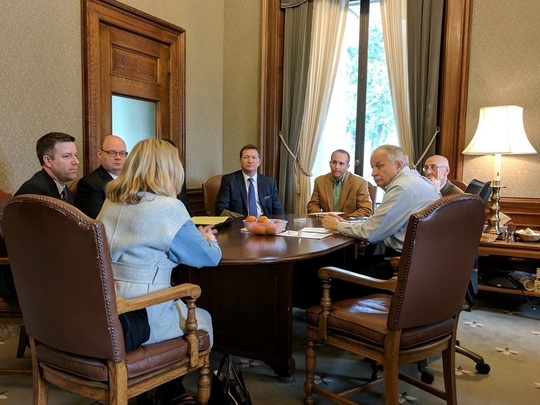 Knowing that the Speaker of the House likely shares my interest in making sure tree fruit workers get paid without threatening a key sector of Washington’s largest employer – agriculture – I arranged for growers to meet with him yesterday along with other key members of the House. The meetings all went very well. I am hopeful that the discussions will lead to SB 5720 advancing in the House. Receiving questions and comments from you is an important part of my job and helps me stay connected with you. I recently mailed a card containing my legislative contact information to people across the 12th District, and encouraged them to write back with comments and questions. One of the many responses included a question that often comes up when the Legislature is discussing education funding: Doesn’t the state lottery pay for education? When Washington created a lottery in 1982, the proceeds were directed into the state’s general fund. Changes in law eventually shifted the revenue directly to education. 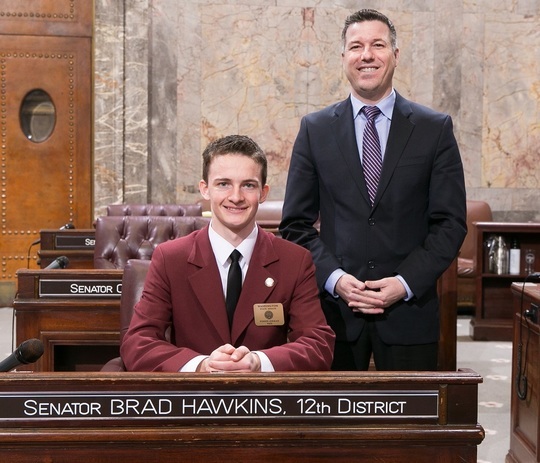 In 2010, the Legislature committed approximately $100 million annually from lottery proceeds to a new “Washington Opportunity Pathways Account” that also supports early-childhood education and college-financial aid efforts. In 2016, the lottery contributed $128.8 million to the Opportunity Pathways account. Meanwhile, the Legislature budgeted more than 10 times that – over $18 billion – toward K-12 education in the 2015-17 operating budget. The answer to the lottery-for-education question is this: yes, the lottery still supports education, but the lottery doesn’t bring in enough revenue to be a major source of education funding in our state. Thanks for the question! Fisher Lehman did a great job serving as a Senate page this past week. Fisher is 15 and a homeschooled 10th-grader; he's the son of Holly and Larry Lehman of East Wenatchee.